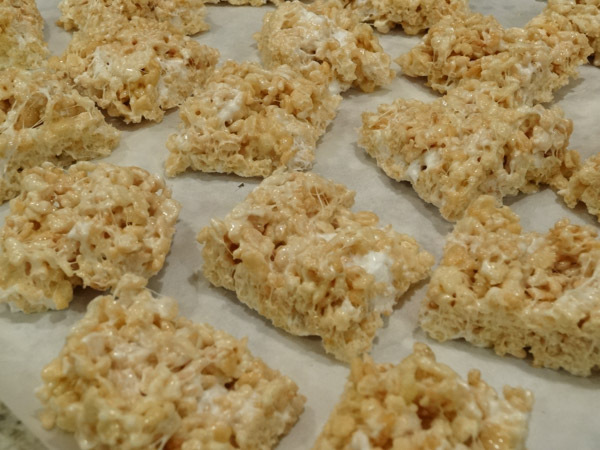 Rice Krispie Treats require only three ingredients to make these gooey, marshmallow treats. Easy to make. Here’s an admission. 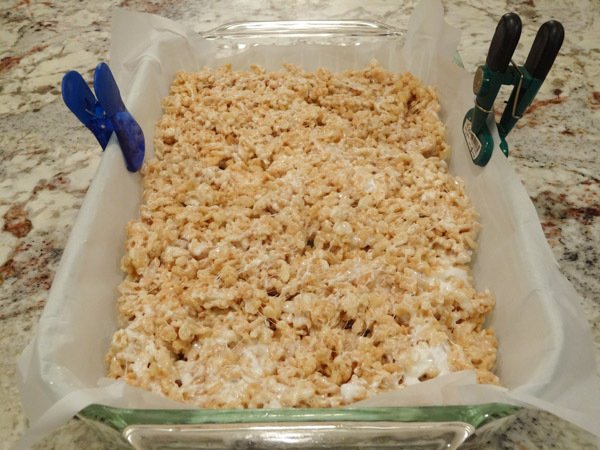 I have never made Rice Krispie Treats during my adult life until now. Why? I likened these treats to the equivalent of hard, styrofoam squares which held absolutely no appeal to me. My daughter has occasionally brought these treats home from a bake sale or has purchased one from a vending machine. I would examine the hard square and have no desire at all to eat it, much less replicate making it. As I was perusing around on Pinterest, I saw some pictures of this dessert and I was intrigued. While I’m not a fan of the original recipe, who knew that the addition of a little more butter and a lot more marshmallows to the recipe would make this a quick and fantastic tasting dessert. These squares won’t get super hard like the original recipe. They stay chewy and gooey even on the second and third day. I liked these squares so much, I ate four of them in one night. There was something about the crunchy and the sweet that was completely addicting. Prepare 9 x 13 inch baking dish by lining with parchment paper. Lightly grease and set aside. In large sauce pan, melt butter and six cups of miniature marshmallows over low heat, stirring frequently until marshmallows have melted. 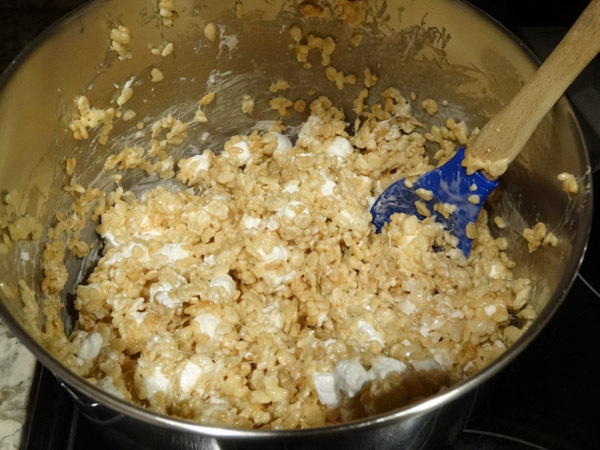 Remove from heat and add six cups of Rice Krispies cereal. Stir until well coated. 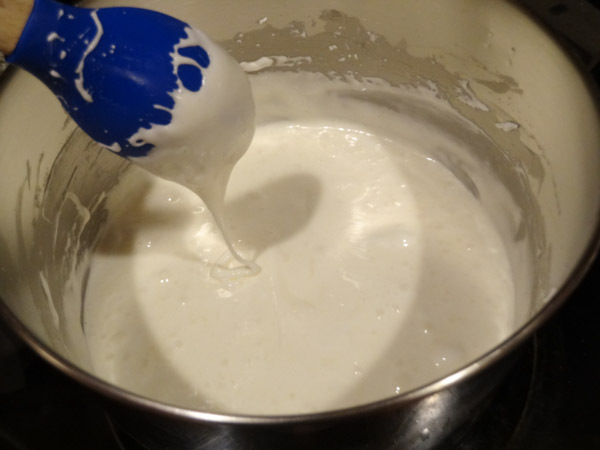 Add one to two more cups of miniature marshmallows to mixture (I used two cups) and stir until well-blended. Tip: secure parchment paper to sides of baking dish with chip clips. This prevents the parchment paper from sliding all around while you try to get mixture into pan. Let cool for about 30 minutes and then cut into squares. Store in airtight container. Tip: if storing bars on top of each other in a container, make sure to use wax paper inbetween to prevent bars from sticking together. 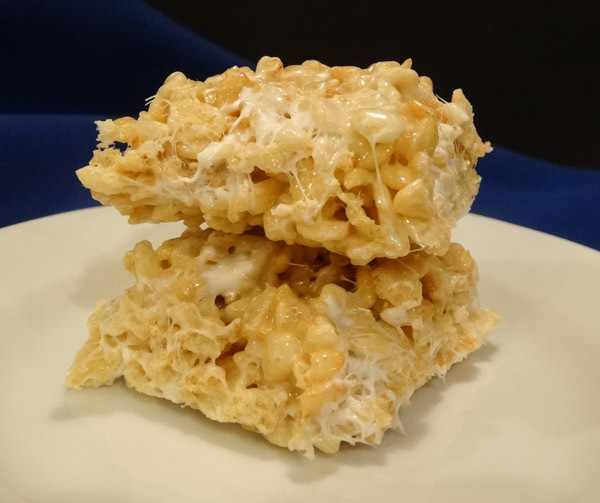 Rice Krispie Treats Recipe require only three ingredients to make these gooey, marshmallow treats. Line 9 x 13 inch baking dish with parchment paper and lightly grease. Set aside. 2. Place butter and six cups miniature marshmallows into large saucepan. Heat on low, stirring frequently until marshmallows have melted. 3. Remove from heat. 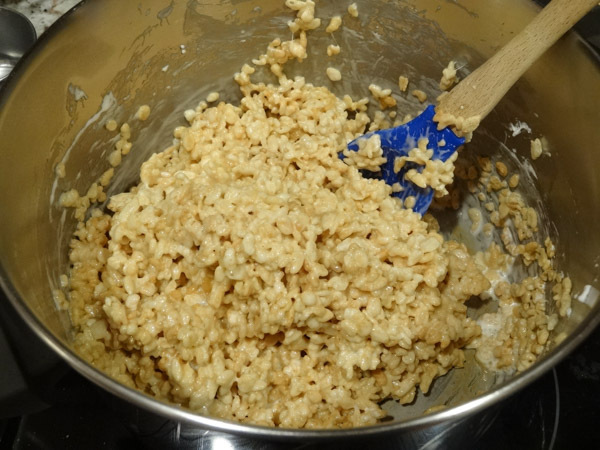 Add in six cups of Rice Krispies cereal, stirring until well-blended. 4. Add in remaining two cups of miniature marshmallows, stirring until combined. 5. Place large spoonfuls of mixture into prepared baking dish. Gently press into dish with back of large spoon or rubber spatula. 6. Let cool for 30 minutes and then cut into squares.